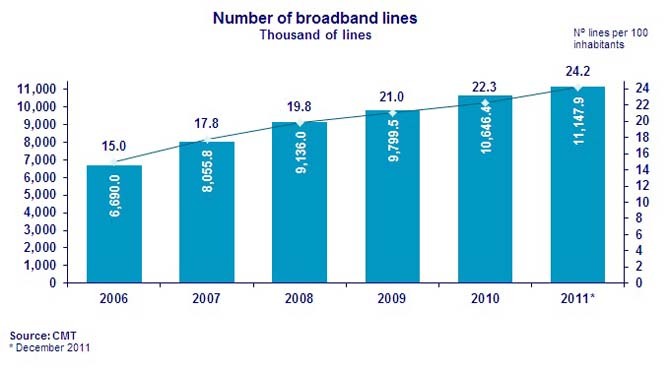 In December 2011, the number of broadband lines continued to increase reaching 11.15 million lines, 5% more than in the same month of the previous year. The penetration of broadband in Spain has increased 1.1 percentage points with respect to the same month of the last year. Currently, there are 24.2 broadband lines per 100 inhabitants. In the last month, the number of broadband lines has increased by 43,874 lines. 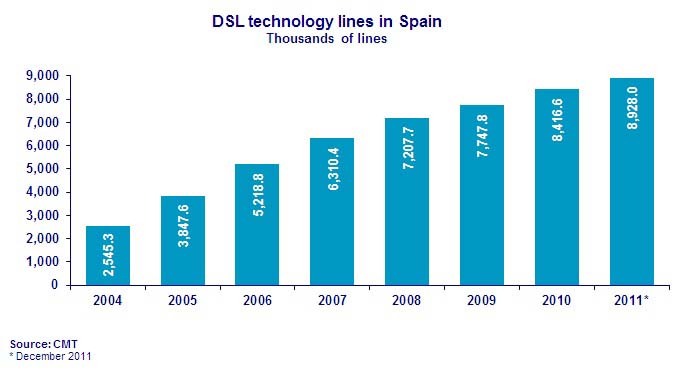 At the same time, the number of DSL lines increased by 34,611 in December, reaching a total of 8,927,965 lines by the end of the month, 3.7% more than in the same period last year. Regarding, cable modem lines, the number of these diminished by 3,710 in the last month representing a total of 2,048,792 lines, 4.9% more than in the same period of the previous year. Data provided by operators to the Telecommunications Market Commission (CMT).